This article is about the hereditary title of nobility. For other uses, see Marquess (disambiguation). "Marchesa", "Marchese", "Marchioness", "Marquis", "Marquise" and "Marquesa" redirect here. For other uses, see Marchesa (disambiguation), Marchese (disambiguation), Marchioness (disambiguation), Marquis (disambiguation), Marquise (disambiguation) and Marquesa (disambiguation). A marquess (UK: /ˈmɑːrkwɪs/; French: marquis, [mɑʁki])[a] is a nobleman of high hereditary rank in various European peerages and in those of some of their former colonies. The term is also used to translate equivalent Asian styles, as in Imperial China and Imperial Japan. In the German lands, a margrave was a ruler of an immediate Imperial territory (examples include the Margrave of Brandenburg, the Margrave of Baden and the Margrave of Bayreuth), not simply a nobleman like a marquess or marquis in Western and Southern Europe. 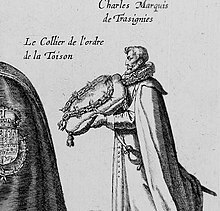 German rulers did not confer the title of marquis; holders of marquisates in Central Europe were largely associated with the Italian and Spanish crowns. 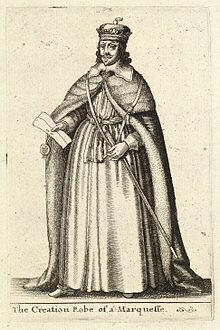 A 17th-century engraving of a marquis in the robe worn during his creation ceremony. The word marquess entered the English language from the Old French marchis ("ruler of a border area") in the late 13th or early 14th century. The French word was derived from marche ("frontier"), itself descended from the Middle Latin marca ("frontier"), from which the modern English words march and mark also descend. The distinction between governors of frontier territories and interior territories was made as early as the founding of the Roman Empire when some provinces were set aside for administration by the senate and more unpacified or vulnerable provinces were administered by the emperor. The titles "duke" and "count" were similarly distinguished as ranks in the late empire, with dux (literally, "leader") being used for a provincial military governor and the rank of comes (literally "companion," that is, of the Emperor) given to the leader of an active army along the frontier. Several marquesses (Markies/Marquis) lived in Belgium, still today this title exists. Currently in Spain the rank of Marquess/Marchioness (Marqués/Marquesa) still exists. 142 of them are Spanish grandees. Normally a 'marqués is addressed as "Illustrious Lord" (Ilustrísimo Señor), or if he/she is a grandee as "Your Excellency" (Excelentísimo Señor). Examples include Cristóbal Martínez-Bordiú, 10th Marquis of Villaverde. 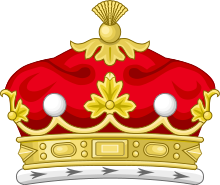 The honorific prefix "The Most Honourable" is an honorific that precedes the name of a marquess or marchioness in the United Kingdom. In Great Britain and historically in Ireland, the correct spelling of the aristocratic title of this rank is marquess (although on the European mainland, the French spelling of marquis is used in English). In Scotland the French spelling is also sometimes used. In Great Britain and historically in Ireland, the title ranks below a duke and above an earl (see "Marquesses in the United Kingdom"). A woman with the rank of a marquess, or the wife of a marquess, is called a marchioness /ˌmɑːrʃəˈnɛs/ in Great Britain and Ireland, or a marquise /mɑːrˈkiːz/ elsewhere in Europe. The dignity, rank or position of the title is referred to as a marquisate or marquessate. The theoretical distinction between a marquess and other titles has, since the Middle Ages, faded into obscurity. In times past, the distinction between a count and a marquess was that the land of a marquess, called a march, was on the border of the country, while a count's land, called a county, often was not. As a result of this, a marquess was trusted to defend and fortify against potentially hostile neighbours and was thus more important and ranked higher than a count. The title is ranked below that of a duke, which was often largely restricted to the royal family. I spoke to Ld M. about the numbers of Peers present at the Coronation, & he said it was quite unprecedented. I observed that there were very few Viscounts, to which he replied "There are very few Viscounts," that they were an old sort of title & not really English; that they came from Vice-Comites; that Dukes & Barons were the only real English titles; — that Marquises were likewise not English, & that people were mere made Marquises, when it was not wished that they should be made Dukes. Like other major Western noble titles, marquess (and marquis) is sometimes used to render certain titles in non-Western languages with their own traditions, even though they are, as a rule, historically unrelated and thus hard to compare. However, they are considered "equivalent" in relative rank. In ancient China, 侯 (Hóu) was the second of five noble ranks 爵 (Jué) created by King Wu of Zhou and is generally translated as marquess or marquis. In imperial China, 侯 (Hóu) is generally, but not always, a middle-to-high ranking hereditary nobility title. Its exact rank (insofar as Chinese words may be attributed a precise meaning) varies greatly from dynasty to dynasty, and even within a dynasty. It is often created with different sub-ranks. In Meiji Japan, 侯爵 (Kōshaku), a hereditary peerage (Kazoku) rank, was introduced in 1884, granting a hereditary seat in the upper house of the imperial diet just as a British peerage did (until the House of Lords Act 1999), with the ranks usually rendered as baron, viscount, count, marquis and duke/prince. In Korea, the title of 현후 (縣侯; Hyeonhu), of which the meaning is "marquess of district", existed for the hereditary nobility in the Goryeo dynasty. It was equivalent to the upper fifth rank of nine bureaucratic orders, and was in the third rank of six nobility orders. In the Joseon dynasty, there was no title equivalent to marquess. In Vietnam's Annamite realm / empire, hầu (侯) was a senior title of hereditary nobility, equivalent to marquis, for male members of the imperial clan, ranking under hoàng-đế (emperor), vương (king/prince), quốc-công (grand duke/duke of the nation), quận-công (provincial duke) and công (duke, rather like a German Fürst), and above bá (count), tử (viscount) and nam (baron). This page is based on the Wikipedia article Marquess; it is used under the Creative Commons Attribution-ShareAlike 3.0 Unported License (CC-BY-SA). You may redistribute it, verbatim or modified, providing that you comply with the terms of the CC-BY-SA.